If you’re looking for a party pad with design chops and the soul of a grown-up hostel, Hotel Harry will hit the spot. 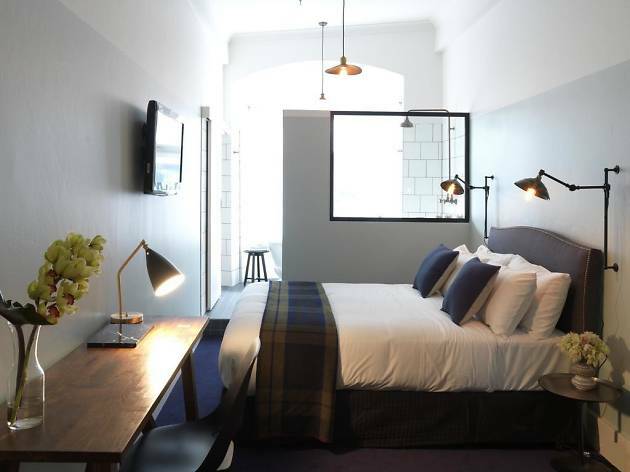 All rooms have antique-inspired fixtures, in fitting with the hotel’s heritage listing (it was built in 1912), and the decor is crisp and simple. Because this is a heritage building, they can’t mess with the facade, which means there’s not a lot of uniformity between rooms. Located above very popular Surry Hills bar Harpoon Harry, the hotel, opened in 2015, has 20 rooms, and infinite opportunities to mingle with the locals. The bar downstairs is packed on weekends – on Friday nights after work drinkers from nearby creative offices kick on well into the evening, while on Saturdays and Sundays international DJs can often be found behind the decks, bringing the party vibes until late. Just because it’s a party bar doesn’t mean you can’t eat there – the menu is dude-food heavy (pork crackling nachos, anyone?) but well executed. The Harpoon Harry kitchen takes care of the room service, so if you’d rather not socialise, you can just eat in. Time Out tip: You get what you pay for here – there are fairly spacious suite options, and much more affordable, smaller spaces – including single bed rooms. Light sleepers should avoid lower-level rooms overlooking the central courtyard which can be very loud on weekends.